Visitors to the Okavango Delta are often forced to spend an afternoon in Maun waiting for a light aircraft charter transfer to one of the camps or their flights out of Botswana. Light aircraft are more susceptible to changes in the weather, and occasionally holiday makers have no choice but to spend a morning or afternoon waiting around for a flight. Most travelers to Maun lament the lack of things to do in this seemingly sleepy town. However, the reality is that with a little knowledge and foresight, and some imagination, there are a number of ways to enjoyably kill some time in Maun. We’ve set out a few of our favorites Maun options below. The Old Bridge is debatably the best place in town to escape the hot afternoon sun and enjoy a cold beer or three. The restaurant and backpackers offers a lazy leafy view over the Thamalakane River. It’s the kind of place where you can either engage in lively discussion with a local, or simply kill some time enjoying your book on some cushions under the wild fig tree. There’s wifi, and a seriously interesting menu which includes hamburgers, some amazing vegetarian options, and even a Peruvian Lomo Saltado. Odd and wonderful things tend to happen at the Old Bridge with traditional folk concerts buzzing with energy occasionally popping up in the late afternoons and evenings. The Old Bridge is located on the Thamalakane river by the Old Matlapaneng Bridge. Any taxi driver will take you there. Expect to pay about P50 ($5) from the airport for a taxi. To return to the airport, just ask the receptionist to call you a taxi for a specified time beforehand. Located within walking distance from the airport, the Nhabe mseum is housed in an old colonial building that dates back to 1939. The museum has a rich collection of cultural artefacts and iconography that depicts Ngamiland Tribes, Chiefs and culture. There is a running exhibition featuring local artists as well as an exhibition of local handmade baskets. Profits from basket and art sales go directly back to the community. The museum staff are friendly and helpful, and all are eager to share their stories of traditional Botswana life with visitors. However, the museum also serves to educate young local Botswana about their own cultural heritage, and groups of school children are often found laughing and playing at the museum during school visits. The Nhabe museum is located a 5-minute walk from the airport down airport road and left onto Sir Seretse Khama road. If you only have an hour or shorter to kill in Maun, the Nhabe museum is the perfect option. Marc’s Eatery is the best place in Maun to enjoy a great meal. 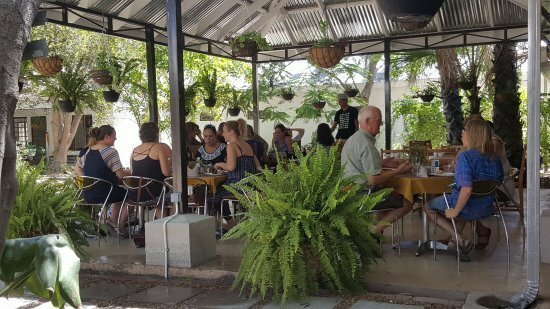 There are a number of restaurants in town, but if you’re looking for quality dining, Marc’s Eatery is likely at the top of Maun’s gastronomic offering. The restaurant was started by Marc Barr and his friend Debbie with the express intent of creating a restaurant that raised the bar in Maun, delivering great food and excellent service in the same punch. Marc prepares a distinctively delightful Venison burger, and the beef fillet is also highly recommendable. Located 3km from the airport down Sir Seretse Khama road, a taxi can take you to Marc’s Eatery for as little as P20 ($2). If you have a couple of hours to spend in Maun, and you’re feeling hungry, then Marc’s Eatery is the place to be. Traditional baskets from Botswana are absolutely beautiful, and are a must in terms of bringing back an attractive souvenir. Most lodges in Botswana sell baskets in their on-site curio shops. If you have time to kill in Maun however, it’s very worthwhile driving out to Shorobe and supporting a community initiative. The Shorobe Basket Co-operative is based in the center of Shorobe, a village located 45 minutes north of Maun. The co-operative consists of 45 women from the community who generate livelihoods for their households by making beautiful palm baskets. 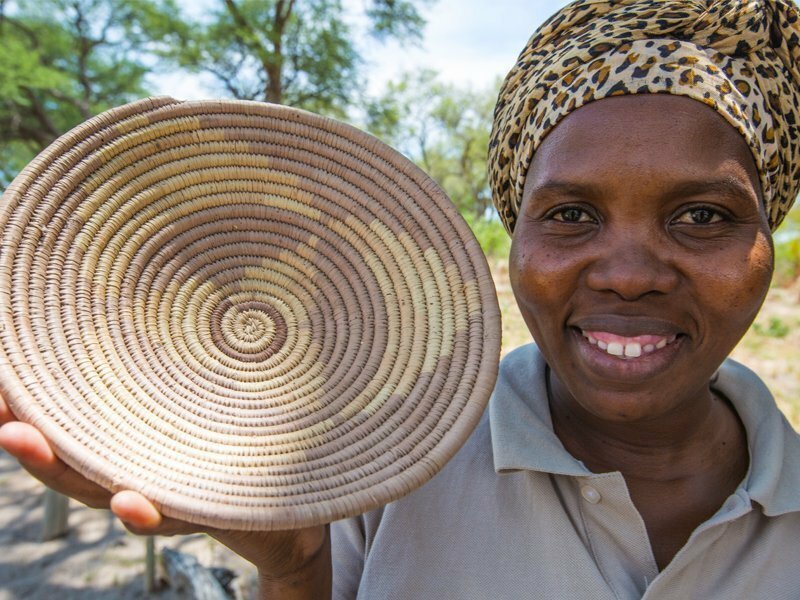 Supporting these women is a great way to directly support an entire community, and also the best way to purchase the most beautiful handmade baskets in Botswana. The Shorobe Basket Co-operative provides a livelihood for 45 women. Mokoro day trips are an increasingly popular way to spend either a morning, afternoon, or entire day while in Maun. Tours start in Maun and depending on the time of year you will either be taken in an aluminum motor boat up the Thamalakane to the Boro River, or you will be driven to the Boro River where you connect with your mokoro poler and professional guide. From there you board a mokoro and spend the rest of the day peacefully poling up river into the Okavango. There is a lot of game to be seen on these mokoro day trips, but the bird life is resplendent. The guides know a lot about the area, and even more about wildlife and birdlife. Lunch, snacks, and drink are provided. Not a bad way to spend an afternoon. You need to book a mokoro day trip in advance. There are numerous options available, but we suggest opting for a professional company. For more information, get in touch with us and we’ll give you more details. If you can suggest any other super ways to pass a little extra time in Maun, let us know in the comments section below.